We are excited to offer a great giveaway to you today. This is a perfect giveaway for a lovely CD which can make this time of year more peaceful. 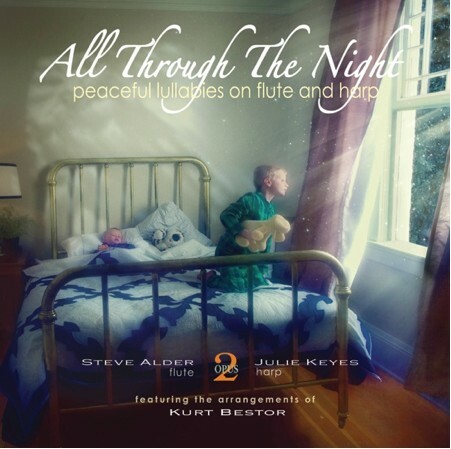 All Through the Night features beloved, time-honored songs woven into peaceful, whispering lullabies on flute and harp. In our busy lifestyle filled with technological distractions, schedule demands and increasing noise, All Through the Night was created to lessen these distractions and to lift your spirit, all the while lulling your little one into a peaceful slumber. Opus 2 Harp and Flute Duo is comprised of Julie Gaisford Keyes of Bountiful, Utah and Steven Lucera Alder of Mesa, Arizona. All of the original arrangements are by Emmy-award-winning composer Kurt Bestor, and the CD cover photography and digital artwork is by Mark Mabry. All Through the Night is now available at Deseret Book, Seagull Book, iTunes, and Amazon.com. Click on "Like this" in the left column of the page. CD All Through the Night. 2. Follow Opus2music on Twitter. This giveaway will end Thursday, December 15th at 11:59pm PT. Good Luck! I liked Opus2music on FB. I think my daughter would love listening to it at night. I listened to the clip of All Through the Night and it's very soothing. I "liked" Opus2music on Facebook! Wonderful CD...thanks for the chance to win! I also went to their webpage and listened to Through the Night...very pretty!!! I liked them on FB. I love the Eldelweiss song. I don't do facebook but did send link of your blog to my daughter who does facebook. Sounds like it would be a wonderful CD. I am a facebook fan of Opus2music. Thanks for the chance to enter. I follow on via gfc. I would love this cd. I play flute music when my grand daughter stays over and she sleeps all night! I liked Opus2music on facebook. Thank you!